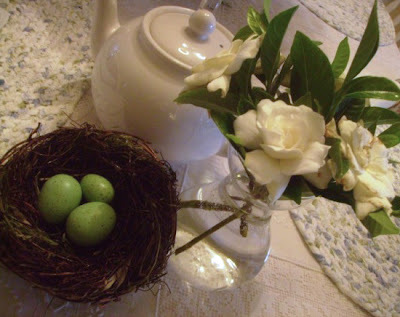 My Romantic Home: I wish you could smell these! I wish you could smell these! Last year my gardenia bush had buds but they would all fall off before they bloomed. I haven't done anything differently this year but it seems to be thriving! I think within a few weeks this plant will be covered with blooming flowers. I love the scent but my daughter hates it. I've met a few other people who don't like it either. 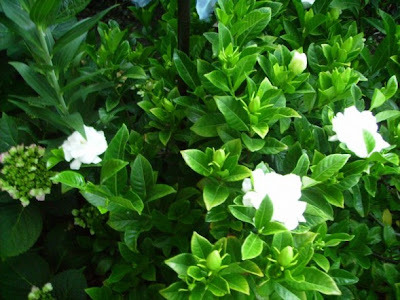 Do you like the scent of gardenias? My hydrangea next to it is starting to bloom also and the lilies and roses are close to blooming too. I love June, everything blooms in unison in my little, tiny, pint-size garden. I'm with your daughter on this one. I hate the smell of gardenias. They give me a headache. I think they are really pretty to look at though. My hydrangias are blooming too! I love the smell of Gardenias. It seems I remember Gardenia corsages, from long ago! Beautiful!! They have the best smell and remind me of weddings! I love the smell and look of gardenias. How wonderful to have all that blooming at once! Delightful! too. You have such lovely things...that little nest is adorable. I love the scent as long as it's only one or they are outside. My mother, on the other hand, hates them. To her they represent funerals. I guess during her era it was a popular funeral flower. I LOVE the scent of gardenias. So does my husband. We also have citrus trees in our backyard - and they smell yummy, too, when they are in bloom. Beautiful site - thank you for sharing! How could you not love the smell of Gardenias? They are my favorite! I had them all over my wedding. It was an "Emma" inspired garden party reception with the smell of gardenias filling the air. lucky you :) i wish i could smell them too. Beautiful images! I also wish that I could smell them. I love gardenias but they don't like me...headache and lots of sneezing. You are so lucky to have such a beautiful garden. I LOVE the scent of gardenias blooming, so I can't imagine why anyone would not. It's so sweet & delicious, really one of my favorite garden scents. Gorgeous!! You really should submit your photos and project ideas to the new Victoria magazine! I love the scent of gardenia. I have some on my desk right now. I'm going to hate when the bush finishes blooming. I had buds fall off one year, too. I have no idea why, but it must have to do with conditions of some sort. I love the smell of gardenias to .